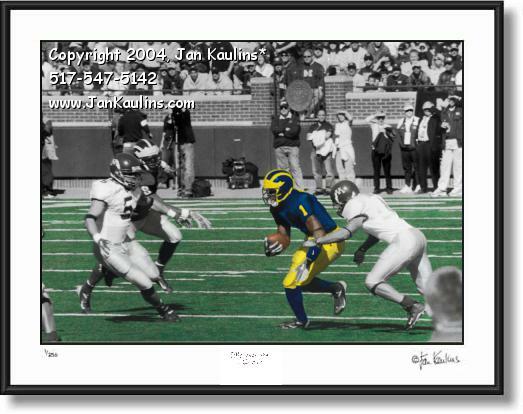 BRAYLON EDWARDS U OF M MICHIGAN STADIUM photo picture art print for sale. BRAYLON EDWARDS UofM Michigan Stadium Braylon Edwards photograph picture printS for sale. This Michigan Stadium UofM Braylon Edwards picture photo print for sale was taken at Michigan Stadium in Ann Arbor during Braylon Edwards final season as wide receiver for The Michigan Wolverines in 2004. Braylon Edwards, Heisman Trophy candidate, was the first receiver in University of Michigan Wolverine history to have three successive 1,000-yard receiving seasons. In this U of M Braylon Edwards action game photo at sold out Michigan Stadium in Ann Arbor we see Braylon Edwards #1 carrying the ball that he has just received, as a crowd of over 111,000 fans watches in Braylon's final season at UofM before going to the NFL. This unqiue color photo is made from an original BLACK AND WHITE PHOTO THAT HAS BEEN HAND-COLORED by artist/photographer. This classic photo was photographed with film (not digital) giving it the slightly grainey vintage texture and feel that can only be had with film photography.